10. Is There a Finn Specific Sports Injury? Tennis Elbow, Jumper's Knee, Footballer's Ankle, Javelin Thrower's and Butterfly Swimmer's Shoulder and Hiker's Knee. Whose knee? Is this to do with long Sunday walks over the countryside? No. It is the condition of knee pain associated with the hiking position in dinghy sailing. 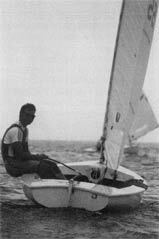 Finn sailing in the early days of the class was nothing like that of the present day because the rig was not comparable. Stiff masts, cotton sails without windows and poor control of the boom made life more difficult for the very early Finn sailor and probably more painful. The sails improved, visibility improved, but it was many years before the elevation of the boom could be controlled with anything like certainty. At that time 'Finn Sailor's Elbow' was the reward for a gybe when the wedge refused to adjust itself, and the boom struck the helm smartly on the not so 'funny bone'! Todays Finn offers a Rolls Royce ride in comparison, and this better control of the rig also takes away some of the desperate last minute excursions outboard. When the sail was far too full, or rising skywards, rapid leaps outboard with consequent risk of hyperextension or excessive rotation of tilt of the lumbar spine, could result in back injury. 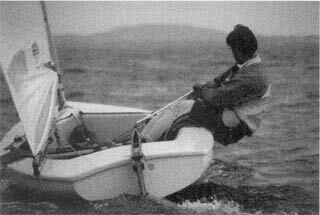 The hiking position itself was always different in the Finn to those designs with minimal freeboard. The Laser has to be sailed semi straight-legged with the knees flexed by about 15°. The Finn offered the possibility of taking the knee joint to the gunwhale so that in the full hike the thigh bone lay against the hull side. In this posture knee flexion was about 90°. In standing, the Centre of Gravity (CG) acts through a vertical line that passes by design close to the hip and knee joints. This results in the muscles working those joints having to do less work in maintaining the upright position. Evolution had sought the most energy effective system. In most sports the athlete is erect. Fully 30% of young persons have a tendency towards a roughening of the under surface of the patella (knee cap) which tends to rub against the underlying lower end of the thigh bone (femur) when working under a load. This causes the most common 'sports injury' seen in young attenders at the Sports Injury Clinic. In the hiking position, be it the full hike as in the early Finn helm, the Star crew or the Soling crew; or the semi-hike as in the 470 helm; or the near straight leg hike of the Laser; the line of action of the CG has moved well away from the knee. As a consequence the loading on the patella in pressing against the femoral surface below is altered. The quadricep muscles, at the front of the thigh, pull strongly upon the upper edge of the patella to which they are fastened. This pull is equalled by the resultant pull on the patella tendon, which anchors the lower edge of the patella to the top of the shin below the knee. There is, because of the bent angle of the knee, a resultant force applying the patella strongly towards the knee joint. In a relaxed standing position this force may be equal to body weight, at 30° knee bend from the straight position 2-4 times body weight, and at 40° 6 times, rising to 10 times at 70° of bend. With a roughened patella surface this will clearly cause pain in some persons. Whether there is discomfort does not entirely depend upon whether the patella articular surface is rough. More it depends upon whether the roughness gets into the wrong place, and this depends upon the tracking of the patella along the groove made for it on the lower articular end of the femur. This tracking is determined by the balance in the action of the four component muscles of the quadriceps. Three of the four pull the knee straight but tend to take the patella too far towards the outside, or lateral side of the knee joint. The fourth, the medial quads muscle, also pulls the knee straight but takes the patella towards the inner side of the knee. There should be a balance. If there is not it is usual for the outer three to win and for the patella to scrape along the outside of the groove and cause pain. In such circumstances the Finn sailor should perform specific physical exercises to improve the medial quads. Any qualified physiotherapist will teach these to you. 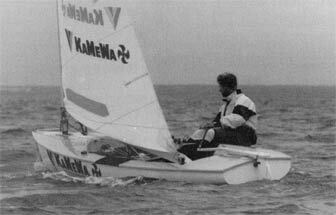 At times a spell of sailing in the Laser dinghy with its more straight legged hike will be a more enjoyable form of therapy to enable you to return to the Finn with your medial quads in better shape, since they benefit from working in a less flexed position. Runners are also troubled by Hiker's Knee in which case it may be called 'Anterior Knee Pain' (ÀÊÐ), or by the more old fashioned name of 'Chondromalacia Patella' (which is more correctly the name for the roughened patella surface). Biomechanics, the study of mechanical laws relating to body movement, has shown that runners who excessively 'pronate' the feet (flat footed) are helped by lifting the inner side of the foot with an 'orthotic' insert. For every degree the foot pronates the shin bone rotates inwards along its length by one degree. This adversely affects the biomechanics of the knee and the tracking of the patella. It follows therefore, that in hiking, if the feet are crossed over one another in the toe straps, as when one is tired on a long beat, this effect will be the same as a weary runner pronating his feet and enjoying his ÀÊÐ. The feet should therefore be alongside one another and the toe straps positioned so that the strap is over the ankle rather than the toe end of the foot. In the case of short persons there should be no element of the sailor straining to reach straps that are just out of reach. This will generate a 'pronation effect'. In particular the aft end of the toe strap should not be in the centreline of the floor. The straps should be parallel to the mid line of the boat if the sailor has ÀÊÐ, and within easy reach. The avoidance of Low Back Pain (LBP) associated with sailing is best achieved by the adoption of Proper Movement Patterns (PMP) within the dinghy. The lumbar spine (the spine relating to the low back below the ribs) is the origin of the most powerful of the muscles concerned with flexion of the hip joint. Ilios-psoas muscle arises from the five lumber vertebrae and from the inner rim of the pelvis. It is used to bring the body inboard from the hiking position, to hold it in the hiking position, and to lower it rapidly outboard into the hiking position. It will therefore be working concentrically, isometrically or eccentrically. It works in conjunction with Rectus Femoris (RF), which is only one of the quadriceps muscles to cross the hip joint. RF therefore is a knee extensor in holding the angle of the knee fixed in hiking, and also helps Ilios-psoas to move the body inboard and outboard. If the abdominal muscles are not strong enough they fail in their duty in holding the body in a fixed position in relation to the pelvis. The body tends to arch backwards upon the pelvis by an increase in the hollowing of the lumbar area as a result of the strong pull of Ilios-psoas. This is the position of hyperextension. When combined with rotation of the lumbar spine associated with sheeting the sail, or tilting sideways in an effort to move weight fore and aft when going over waves, or worse a combination of all three movements under the stress of the heavy jacket, then this is a recipe for Low Back Pain. In older sailor the stress will be upon the front of the spine and discs, in those still growing upon the rear of the vertebrae causing stress fractures. For maintaining a pain free back therefore, the sailor should avoid hyperextension of the lumbar spine, particularly combined with rotation and tilt. In other words there should be correct movement patterns within the boat. Plus a suitable programme of regular abdominal exercises for the low back. During hiking the discomfort that increases over time is due to the muscles of the abdomen, and of the quads, being held constantly in a contracted state. This is 'isometric' contraction and is characterised by the muscle neither shortening nor lengthening as it works. The muscle becomes so tense that the circulating blood cannot enter the muscle, which therefore has to work anaerobically with local accumulation of lactic acid. Ischaemia causes pain. Training to improve hiking therefore should be aimed at a lesser percentage of maximum effort. When they can do this the circulation can enter the muscle which then works aerobically. The best way to train these muscles is to construct a hiking bench to the Finn side deck profile and to spend increasing time in the sit-out position. This will be more effective than spending all your time running, swimming or doing similar conventional endurance type training. Fortunately since the Rectus Femoris muscle helps to control both the knee flexion and hip flexion it is not constantly acting isometrically. As it changes its length to help to alter the body position some fresh blood supply enters the muscle and relieves some of the quads discomfort. The present day Finn sailor is fortunate that the configuration and length of Olympic Courses have changed. The early 2 mile windward leg at major championships with race durations of over two hours have changed. The fifteen minute windward leg now entails less long hikes on one tack. The overall race length of about fifty minutes is considerably shorter. The sailing technique may therefore become one in which a more 'semi hike' than 'full hike' position is adopted for longer portions of the race. Hiking bench training position should reflect this. The training effect is joint angle specific. - The adoption of a good flexibility and muscle stretch programme. - The adoption of Proper Movements Patterns within the dinghy. - Time devoted to a structured Hiking Bench. Training Programme to minimise isometric muscle discomfort, which will increase sitting out time.